Works Progress is currently run by artists Colin Kloecker and Shanai Matteson. Based out of Minneapolis, Minnesota, it focuses on creating “collaborative projects that inspire, inform, and connect; catalyzing relationships across creative and cultural boundaries; and providing new platforms for public engagement.” Works Progress began in 2009 as a group effort with three major projects: Salon Saloon, a live-action arts magazine produced by Works Progress and artist Andy Sturdevant; Solutions Twin Cities, a rapid-fire visual storytelling format that brought together the region’s most inspiring changemakers, founded by Colin and collaborator Troy Gallas; and Give and Take, a program that comprises interactive nights of presentations, performances, and participatory games, founded by Colin, Troy, and collaborator Ben Shardlow. Since then, Colin and Shanai have continued to create short- and long-term projects that focus on producing community both within and outside of the art world. Colin and Shanai are a married couple and at the time of this interview were about to have their first child. Though they have little to no safety net and their take-home income is variable every year, they were relatively calm about the demands of the life in front of them. This interview made me think a lot about the benefits of both public programming and collaborative practice. Super easy to talk with, they have come in direct contact with thousands of different people through their projects over the past (almost) four years. It’s no surprise that, in 2010, when they committed “Career Suicide*,” their community put them back to work. As an inherent homebody, I’ve made the realization relatively recently that you can build a community simply by reaching out and asking people you admire to work with you on something. The trust that you build from a mutually beneficial working relationship can be enough to create friendships and new partnerships for the future. Financially, Colin and Shanai had assumed starting out that they would form a nonprofit, but after testing the waters as a fiscally sponsored project and intentionally thinking about their model, they feel that, for now, they’re more at home in the for-profit sector. In addition to the commissions and grants they receive, they do some design and consulting work and are subleasing an apartment, workshop, and coworking storefront from the building that they have rented (and live and work out of). Social practice artists would do well to understand, as they have, that the projects they foster accomplish a goal that many organizations and businesses desire: engagement. *”Career Suicide” is the term they used to describe quitting their full time jobs in favor of pursuing their own projects. The following interview is lightly edited for length and clarity. It touches on Colin and Shanai’s decision to go for-profit, their Career Suicide pact with friends, and the ways in which they’re always trying to utilize and learn from past projects for future funded opportunities. Can you tell me about your start-up story? Colin: We should find a way to really thank them, at our work. Did you guys quit at the same time? S: Everybody did it. One of the things that had held us back for a long time, at least for me, with quitting my job was that I was afraid I was quitting some kind of trajectory that I was on — that I was working my way up in an organization. It felt like that was what a career was, you work your way up. But it wasn’t really realistic because so many people in the organization I worked in, because the economy was so terrible, they were never going to retire. So we decided Career Suicide meant getting rid of that idea of a trajectory. S: Yeah. Our rents are cheaper than they are other places, too, so I suppose that helps. We definitely have times where we’ve gone for two months or more without being able to pay our bills, where we’d just get backed up and we’re like, “Sorry, landlord, we can’t pay you until we get our next big check, and then we’ll pay you and whatever fees we need to pay.” It wasn’t like it was a smooth transition. C: And here’s the other thing: neither Shanai nor I has any kind of safety net. Neither of us has rich parents, we don’t have any trust fund, there’s no stash of money hidden somewhere if something bad happened. Even though I feel like it’s two years later and we’re sort of established, it still feels risky. In the next year or two, especially having a kid now, we’re going to want to be thinking about it — if we can maintain this amount of money for a year, that will be great. If we can add on to it, that’s money we can put into savings. So you don’t feel stable yet? S: I don’t feel stable yet. I mean, I feel stable in the sense that for the next month I know that we’re stable. I know that that’s not a very long time horizon. I’d like to say that we can survive this way for the next six months. I think if we had one or two big projects a year that were planned far enough in advance, then we could say, “This is how we’re going to pay our bills for the coming year,” and then everything else becomes the experimenting and the additional things as we still have time for them. We happened to have that this last year. In 2012 we had couple of big projects that we got early on, but we’re going into this next year without that. C: Financially I don’t necessarily feel stable either, but I don’t have the expectation that we ever will, really. As you grow and as you expand you might start to be able to afford yourself one kind of stability, but I think that it will always open up a new kind of instability. I worked at an architecture firm — it was a small firm — there were about 10 architects and two principals, and the two principals were actually a married couple. In some ways it’s kind of similar to what Shanai and I are experiencing now. They started as just a duo, and over the course of about 12 or 15 years they built the firm up into a successful mid-size business. The budget and money were a constant source of stress for both of them. While they were able to buy a really nice house, have a kid, send her to a really great school, have nice cars, good health insurance, and all of those things, and probably money in savings, they were also taking on new employees, and suddenly you’re responsible for the livelihood of 10 or 12 other people. That’s just a new kind of instability and stress that comes with money. So you were fiscally sponsored for a few years, but now you are transitioning into a for-profit group. What happened and why? C: We were hitting the three-year mark, and we were feeling internally like we wanted to make a decision to go one way or another. I think that fiscally sponsored gray space does allow you a lot of flexibility. You don’t have to form a board, even. You can still kind of operate in whatever way that you want. But over a year of thinking intentionally about it, we started to realize that the nonprofit model is just busted. It would really change our strong points, which are that we’re really nimble, we’re really flexible, we don’t have a lot of overhead. We realized that we can take all the things that we really like about the nonprofit model and still do those things. S: And we can make decisions and initiate projects really quickly now, because we don’t have this board that we have to deal with. Everything is just much quicker and smaller. C: We realized that one of our core tenets of the work that we wanted to continue doing was that we thrive working in collaboration and in partnership with other artists or with other organizations. Most of our income this year and last year has come through those partnerships. In none of those situations would it be necessary for us to be the nonprofit. We were either able to access grant dollars that didn’t require nonprofit status, or work with these nonprofits or foundations that had the money to pay. We just felt like as long as you keep this idea of working in partnership we can stay small, we can stay nimble, and still partner with the same people. But we don’t need to have that nonprofit bureaucracy with what we’re doing, and it’s actually better if we don’t. Why does one model exclude the other? S: Well, one of the things we realized was that in a lot of these situations where we wanted to go after a grant collaboratively we were actually competing against the people we would partner with. We were thinking about our growth model and if we were to continue to try to grow as a nonprofit we could potentially be in competition with some of the groups that we want to, and already do, partner with. That wasn’t so much of an immediate thing. I think that we could continue to get hired as a fiscally sponsored nonprofit. But a lot of the grants that we were looking at were grants that we needed to be a full-fledged nonprofit to apply for anyway. There were lots of barriers that we kept running into. It felt like we were having to push and shape ourselves into the nonprofit model to get those grants. Your fund-raising percentage is very low, both in time and money. Does most of your work just come to you? S: Mostly, yeah. It just kind of does. We did a Kickstarter campaign. We have done little things like that around here on a project by project basis. Generally, unless it’s a grant, which we’re doing less and less grant writing, mostly people just get in touch with us. They’ve heard about the work we do or someone recommends that they call us or see our website. I was thinking that in the balance of time we spend on our work, very little of it is spent on what I would call fund-raising. There is some development that is relationship development, which I guess is usually the job of the fund-raiser. C: We’ve also done a lot of communications work, just working on our communications plan. We approach our social media in a way that is always constantly building toward the next thing. We don’t do a lot of marketing type stuff, it’s more working with our existing network. What are some non-monetary payoffs that you feel like you get from doing these projects that are experimental, that might fail, that don’t bring in money? S: I think that for some of the projects we do on an ongoing basis that don’t make money the payoff is that they actually bring in paid work. So, like Salon Saloon, the talk show that we do once a month, we don’t make any money. I mean, we make $300, but we pay $300 out. We don’t get paid, and neither does Andy [Sturdevant, host of Salon Saloon]. C: Or any of the others who volunteer their time and creative energy to the show. S: But at the end of the day, Salon Saloon has gotten a lot of exposure for the artists that go on the show, and also for Andy — it has led to other opportunities for him, paid opportunities. Likewise for us, I think that there are probably things that have come our way because of that show, as well. It’s also built a lot of goodwill in our creative community, that I think it’s much easier for us to go to some of the folks we’ve built these relationships with and be able to work on new projects and for them to take it on faith that we’ll develop something together because they’ve been part of this other thing that was successful. It brings in other work. I think also, in a tangible kind of way, it allows us to live the kinds of lives that we want to have, like personally fulfilled creative lives. I think that the work we don’t get paid for is stuff we want to do. It’s fun and how we connect with people. C: It stretches our boundaries. It allows us to grow, I think. It does become part of our experience and part of what we can bring to a new situation. 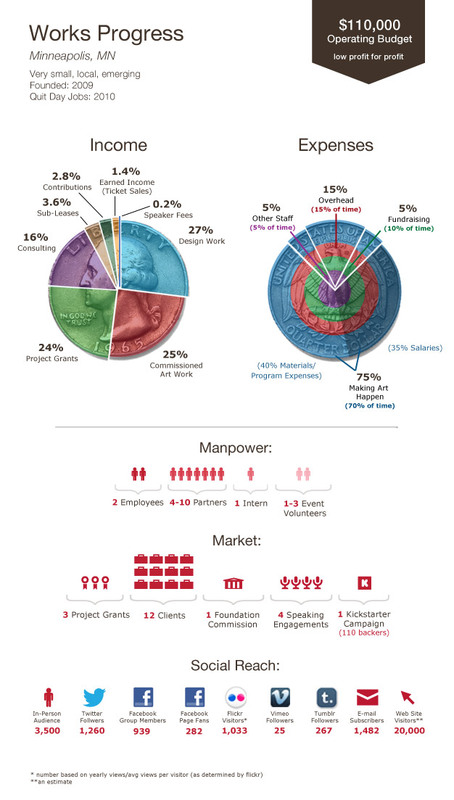 What’s the percentage of the projects that you execute that are paid versus unpaid at this point? S: Every project has a portion that is unpaid, but it is hard to quantify because it is just a way of working now that as long as our bills are paid and we’re not so overworked that we have no time in our lives, it feels like it balances out. Maybe 15 percent? C: This year our only unpaid projects are things we’re developing internally, for one reason or another didn’t find a partner or need to have one, and it’s something that we wanted to just do. A Public Thing is a good example. We wanted to do a public conversation actually about money, about finances, inspired by Occupy Wall Street. So we tried to hold a public conversation on public ground and then take that and turn that into a newspaper in a really small amount of time. We ended up just doing it, organizing the event, we got about 50 people or so to show up, we had the conversations, and then over the course of a month we took that content, and created a lot of new content, and laid it out in a newspaper. We ended up just putting up about $600 to print it ourselves. We made 2,000 of them. It was a really fun project that we want to do again. There are a couple of opportunities that we’ve identified to actually raise $2,000 to $3,000 to do that again. It’s almost always like that: if we do something or try something that we are just doing on our own, and it’s unpaid, Shanai and I are going to think about how we can make that into something that we can use again in the future. If we’ve designed a platform that works or something that is a successful project, we think of it like a useful tool that we can use with a partner on a new project. Another example is a project that we started in 2009 called Give and Take — it’s a live program that’s like a community get-together. We’ve now spent about nine months taking what we’ve learned from that experience and are turning it into a starter kit, so that people can purchase the elements to do a Give and Take themselves. Then they just do it in their living room or at their place of work or whatever. All of that the last nine months has been kind of unsupported financially, but we’re really close to having a product that we can start to sell. When you do run programs that don’t make money, how do you evaluate success? You said a little bit about how you sort of think about this as an investment or a tool that you’re going to be able to use further, but when you evaluate the program, is that the mark that you evaluate doing something with? C: I think that’s a good indicator. We think it was successful if we would want to do it again, or not. What are your goals? Both financial and not. S: I think that sustainability is a goal. I think that growing a little bit both as a business and with the money that we bring in is definitely a goal. As far as the work, I think we want to be able to be in the space where we can experiment, not so rigidly defined that we feel like we’ve just created a job for ourselves that doesn’t have any kind of creative or expansive possibilities. Sustain ourselves financially, grow a little bit, and still be fulfilled creatively. C: A long-term goal for me personally is to have a kind of messiness and flexibility in our studio — working all different kinds of projects, playing all sorts of different roles, with ideas big and small. What about financial advice for someone else? What has worked for you, and what hasn’t? And what are some challenges you’ve faced and overcome? S: I’m just laughing at us because I don’t know that we are qualified to answer that. We still have people who come to us and say, “I’m thinking of quitting my day job, or cutting back on my job so that I can focus on some creative stuff that I’m doing, and I’m inspired by the fact that you guys just did that — what advice would you give me?” I think I would tell those folks that we do grapple with that instability that comes with a self-funded creative life, but it is something worth doing when you can. If you don’t have a medical condition that prevents you from losing your health insurance and you don’t already have kids that you’re worried about, then there comes a time when it makes sense to deal with the instability, but also to put in the long hours to get it going. As far as other kinds of things, we eventually found a way to get legal advice from some creative lawyers that we know who helped us set up the business structure. I now think that if we had been meeting with those folks a lot earlier, it might have been helpful. Know what you don’t know and admit to what you don’t know and seek help with that. There are a lot of resources out there for people to self-educate on business. C: Because we transitioned out of our full-time jobs directly into this, we had to approach it as a business and with focus on our monthly expenses from the very beginning. It’s not what I would recommend for just any artist who wants to paint full time, but I think that for a certain kind of person who is on the entrepreneurial side and who wants to utilize and explore those skills, I recommend that you think realistically about if you’re able to fit the work that you’re creating into a model that would support you. That is maybe a good way to approach it. Find partners, do it with other people, make a Career Suicide pact with other people who are at the same point that you’re at. Learn from each other and do it together. Also, don’t be afraid to cold-call up the chain of people who have the money to support the work that you’re doing. If you’re able to talk to larger businesses or organizations and able to represent what you do well, if they like what you’re doing, they’ll find a way to hire you. It might not be in the next week, but it will be in the next year or sometime when the moment is right — you will have a support system. I feel like that’s what really allowed us to make the transition — that three years previous to us quitting our jobs we had been building up our network. We were pretty public about quitting our jobs. I think that this actually really helped. A lot of people, in a sense, had our backs — that social capital that we had built up prior to takeoff is what really propels us forward in our work.